This is a story about a unique place with an exceptional history, and the people who call it home. It is also a story of the cultural cross currents that roil our times: the struggle to maintain tradition and culture in the face of a rapidly changing world, the lines we draw to define and defend what is ours, the ties that bind us together, and the fear that threatens to tear us apart. It is about the pain of past injustices, and the efforts to heal age-old wounds to create a shared future; it is about voices that haven’t been heard and stories that haven’t been told. It is about the opportunity to honor land held sacred by Natives and Anglos, and to transform contested ground into common ground. The best way to comprehend the Colorado Plateau is to take wing. With the benefit of a bird’s-eye view, the scale and rhythm of the landscape come into full relief: the endless ridges, buttes, mesas, and canyons, sculpted and painted by water and wind, glowing red at sunset and gleaming white at dawn, streams and rivers the veins and arteries through which the desert’s lifeblood and scarcest resource flow. The land bears witness to explosive emergence and tectonic shifts that shaped the earth into otherworldly formations: cinder cones, rainbow bentonite hills, and jagged anticlines. It is country that both tests the body and stirs the soul. Aerial photo of the San Juan River. 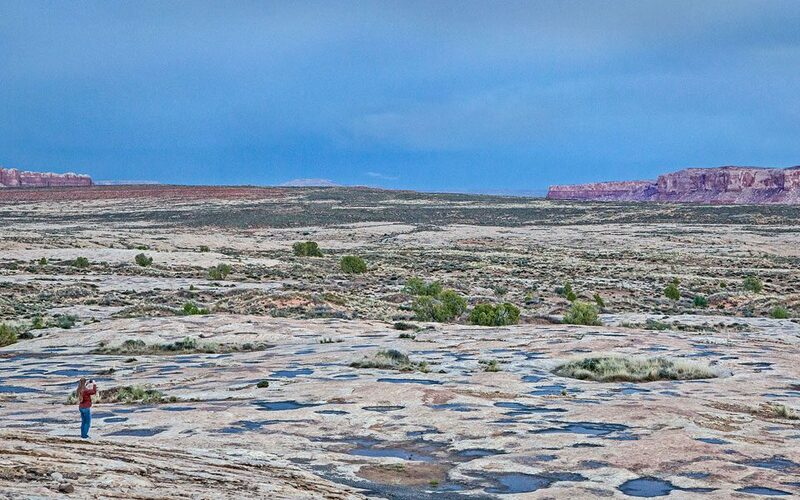 The focus of our story is San Juan County, a nearly 8,000-square-mile stretch of land in Utah’s southeastern corner. One of the poorest and most sparsely populated counties in the state and the country, it is bordered on the east by Colorado’s San Juan and La Plata mountain ranges, on the west by the sinuous path of the Colorado and Green Rivers, on the north by Moab and the eastern half of Canyonlands National Park, and on the south by the Arizona state line and the Navajo Nation. Read the full essay at Terrain.org.